I have talked about wanting to be French. I also want to be Korean. This is not because of the Olympics, although I was incredibly impressed by the opening ceremony. This is about the food. I have always loved Korean food: flavorful, rich, vibrant, and loaded with vegetables. To me, it is a perfect cuisine. Cooking authentic Korean food is not something you can easily teach yourself. Fortunately for me, one of my closest friends, Sora, is Korean. She’s also from Michigan, so we are bonded by our Midwestern roots as well. She makes numerous things really well. My younger son and I are slightly obsessed with her mung bean pancakes. A meal at Sora’s house is a real treat–authentic cuisine that is delicious from start to finish. Now matter how good a friend someone is, getting anyone to reveal family recipes ordinarily involves a slow dance. But Sora agreed to share her killer kimchi (or kimchee, as it’s also spelled) recipe, and boy is it fantastic. 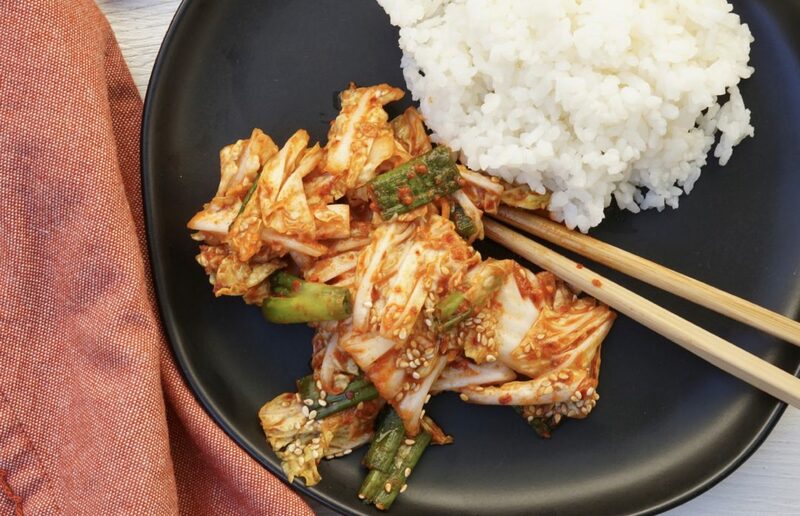 I wanted to keep this post to stay authentic in my post, Sora also provided some fascinating history about where this recipe came from, her South Korean heritage and this type of kimchi in particular. 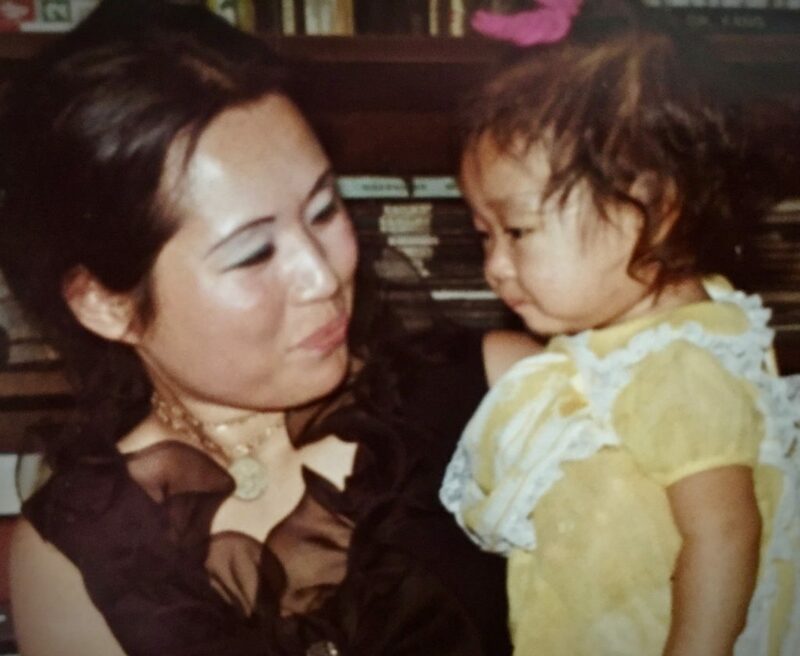 “My mom is from Kwangju in the Cholla Province of South Korea. This area is known for their rich soil and agriculture, thus producing some of the best produce in the country. The Cholla Province is also known to house some Korea’s best traditional cooks and food. The kimchi from this area is spicier and more saucy than other neighboring regions and many believe to be the best representation of kimchi. However, every Korean family has their own kimchi recipe and that’s what makes kimchi special, there is no right way, it’s all based on taste and preference”. “Some of my earliest memories are of watching my mom make endless amounts of kimchi and oh the variations of kimchi from “oy kimchi” (cucumber), “baechu kimchi” (whole Napa cabbage) to “chongkak kimchi” (radish). She would fill bottle after bottle of kimchi storing them for our future meals, and we loved every single bite. When the local Korean grocery started carrying pre-made kimchi, my mom thought this was a time saver. Little did she know that my siblings and I would denounce store-bought kimchi as a watered down, (short-cut) 7-up cheat version of “true kimchi.” There is no replacement for homemade traditional kimchi. 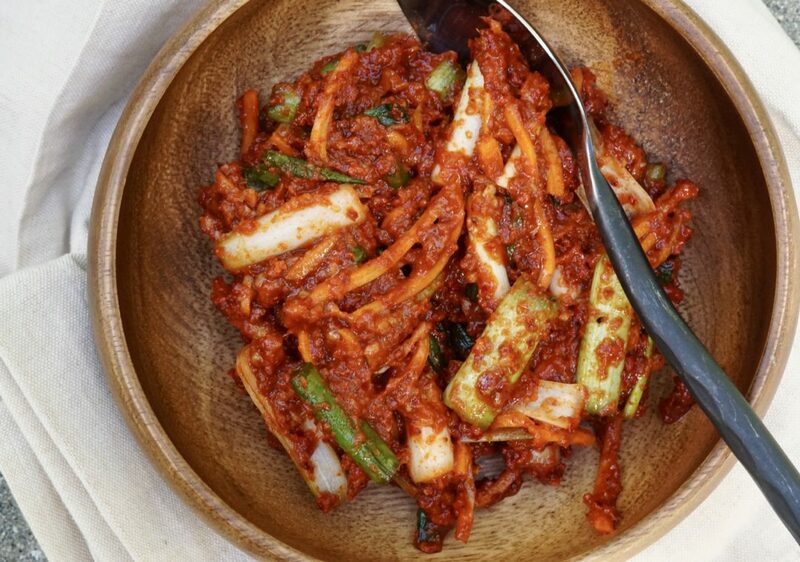 Once you’ve had good kimchi, you can’t go back to any lesser version. Kimchi making is a badge of honor for a Korean cook and one that is achievable for any kimchi admirer. Traditionally, kimchi would be stored in the ground to “refrigerate” and allow for fermentation. 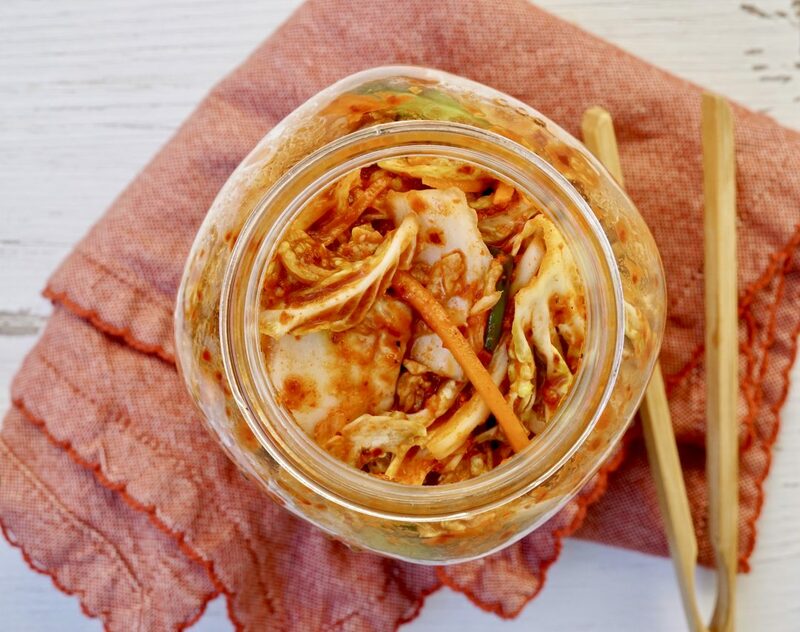 We now have special “kimchi refrigerators” that allow for perfect fermentation temperatures to store kimchi for lengthy periods up to 12 months”. 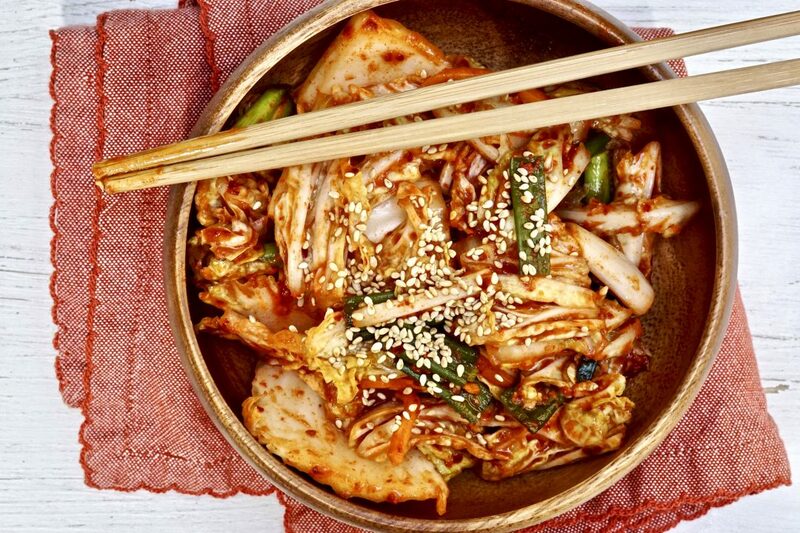 Kimchi is a staple in the Korean cuisine. Considered a national dish in both South and North Korea, kimchi is a traditional side dish made from seasoned fermented vegetables, most commonly Napa cabbage. It is estimated that Koreans eat about 40 pounds of this spicy condiment per person per year. That’s a lot of kimchi. To my amazement, there are actually hundreds of different types of kimchi and each version can vary substantially, as Sora mentioned. Kimchi has been around a very long time, some trace it as far back as the Three Kingdoms, around 37 BC, although the ingredients have evolved slightly with the introduction of chili peppers in the early 17th century. 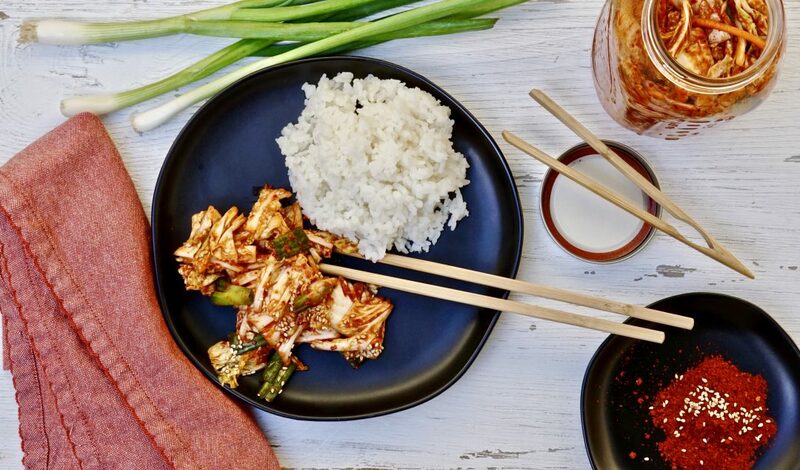 From a health perspective, kimchi is loaded with good stuff and Americans have finally caught on. Koreans eat this fiber-packed condiment on just about everything, and I get why. Used in soups, pancakes, tacos and burgers, it makes everything better if you ask me (or my husband, who is a huge kimchi fan). Loaded with vitamins A, B and C and also containing “healthy bacteria” lactobacilli, which is found in fermented foods like kimchi and yogurt. This bacteria helps promote good digestion, prevent yeast infections and may even help stop the growth of some cancers. So whether you are a long-time lover of kimchi or a curious foodie, I encourage you to eat it if you haven’t yet and not to be afraid to try to make it. At Sora’s suggestion, I included two recipes that seems almost identical, but they are not. These recipes do not contain any added sugar but Sora mentioned at times people will add some to balance the heat. On occasion, her mother will add a bit of plum syrup to hers. Sora shoots straight. 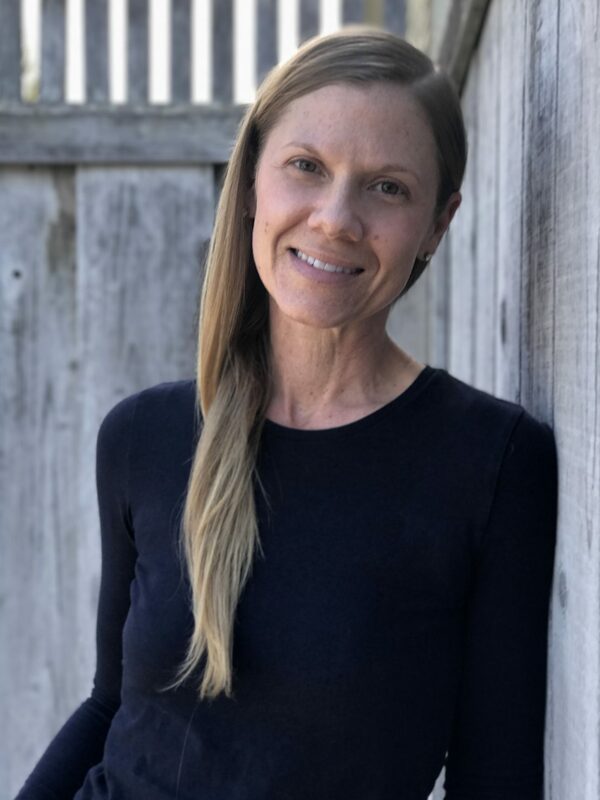 She has named these two recipes simply “easy” (a quicker version made with chopped Napa cabbage) and “hard ” (one with identical spices but with quartered cabbage requiring more prep work). Both versions are fantastic. NOTE: Here are links for some suggested ingredients used to make kimchi: Salted (fermented) shrimp sauce, Viet Huong fish sauce, Korean red pepper powder, disposable plastic food safety gloves. Step 1 Place the cleaned cut cabbage into a large bowl, add the kosher salt and cover with water. Using your hands mix well to incorporate. Allow cabbage to sit for at least 4 hours. After soaking the cabbage it should be soft, if the cabbage cracks or snaps, soak for some additional time. When the cabbage is ready, drain throughly in a strainer and rinse well with water using your hands to help remove the salt from the cabbage leaves. Set aside to drain completely. Step 2 For the rice porridge. In a small saucepan add the cooked rice and water and place over low heat. Simmer for about 5 minutes to thicken. Remove from the heat and allow to cool. When cool enough to handle, blend in a food processor until smooth. Set aside. Step 3 For the sauce: In a large mixing bowl add the shrimp sauce, fish sauce, scallions carrots, garlic, red pepper powder, half the rice porridge and the cold water, mix well. Add the drained cabbage and using your hands (ideally with plastic gloves to avoid staining of your hands) toss well to coat. Gently message the cabbage so the flavor is covering all cabbage pieces. Taste and adjust the seasoning as needed. Typically more fish sauce or red pepper powder would be added. At this point more rice porridge may need to be added as well. Note: you want the mixture to look wet and glossy, all vegetables should be nicely coated with the sauce as shown in the photo above. Step 5 To ferment, place the kimchi in glass jars or an airtight container and store in the refrigerator. Step 1 Place the cleaned quartered cabbage into a large bowl, add the kosher salt and cover with water. Using your hands gently message the salt into the cabbage leaves making sure to get inside and close to the core, which can be firm. Allow cabbage to sit for at least 6 hours. After soaking the cabbage it should be soft, if the cabbage cracks or snaps, soak for some additional time. When the cabbage is ready, drain throughly in a strainer and rinse well with water using your hands to help remove the salt from the cabbage leaves. Set aside to drain completely. Step 3 For the sauce: In a large mixing bowl add the shrimp sauce, fish sauce, scallions carrots, garlic, red pepper powder, and half the rice porridge and the cold water, mix well. Add the drained cabbage and using your hands (ideally with plastic gloves to avoid staining of your hands) gently message the sauce all over the leaves and in between all the cabbage layers to coat. Note: this is the labor intensive part, take your time and do it well so all parts of the cabbage marinate. Taste and adjust the seasoning as needed. Typically more fish sauce or red pepper powder would be added. At this point more rice porridge may need to be added as well. Note: you want the mixture to look wet and glossy, all vegetables should be nicely coated with the sauce as shown in the photo above. Two ladies I love together in one post! Love it! And now to get Sora to reveal the mung bean pancakes recipe….. Thank you both for sharing.